The stimulus for this project was the enormous value that FiSH places on listening to our members. People who are isolated, or sometimes lonely, find the opportunity to talk to people like FiSH volunteers, who are good listeners, very valuable. The chance to tell their story to one of our volunteers is often a significant part of what would otherwise be just a very everyday journey to an appointment. The centenary of the First World War has offered us a rare opportunity to listen to the direct and indirect memories of our members of this momentous event. Listening would itself be therapeutic, but recording these memories has given us the chance to share them with others and to stimulate further thoughts and stories. By creating a community event around this project we hope to not only educate and entertain, but to generate interest in the issues affecting older people and also the work of FiSH. 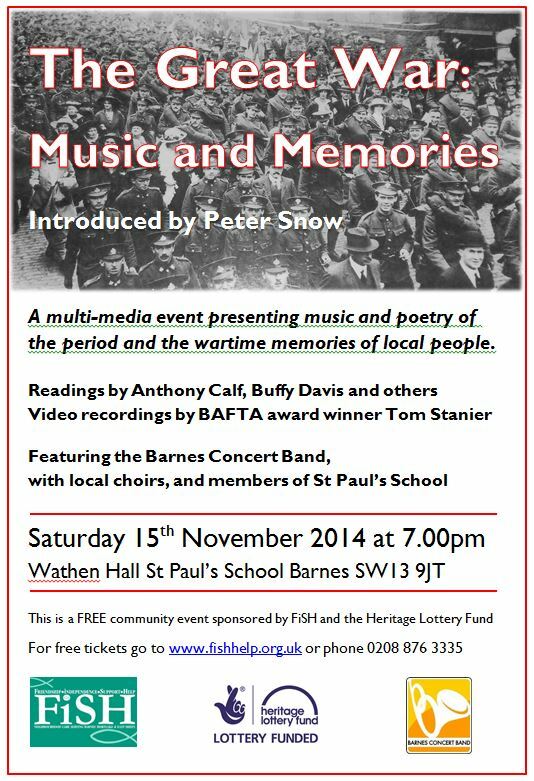 The project has received funding from the Heritage Lottery Fund, for which we are very grateful, and will culminate in an evening of Music and Memories at Wathen Hall, St Paul’s School on Saturday November 15th. This page aims to give just a taste of the stories we have received. He had been in the trenches for many weeks, always wearing the same mud soaked clothes whether he was asleep in a dugout or on the battlefield of the Somme. From somewhere he had squirreled together an empty tin, a spoonful of tea leaves and, most important of all, a candle. He stuck the candle in the mud, filled the tin with water and the few precious tea leaves – and then stood holding the tin until he had made what passed, in his deprived state, as a cup of tea. He could only say that it was a long time before the candle power approached something as near as possible to boiling point. Just as he was about to drink it, a group of soldiers came through the trenches and as, they passed my father, one of them reached out and knocked the tin of tea off the mud ledge and spilled the contents. That, may father said, was when he had the urge to kill, this time one of his own comrades. He didn’t of course. There was rough justice in the army and he would have been court marshalled and shot if he had obeyed his instincts. ​In 2014, as part of the events to mark the centenary of the start of the First World War, FiSH launched an oral history project aimed at capturing the war-time reminiscences of some of our members. We recorded 15 local people who, often very movingly, told stories passed down from parents and grandparents about experiences at the front and back home. The project was generously supported by the Heritage Lottery Fund of the National Lottery, which enabled us to make the video and supporting materials available free of charge to schools in our local area. The video was made by Tom Stanier, an ex BBC director who lives locally. As you will see, it is much more than a series of interviews and cleverly interweaves stories with original footage from the Imperial War Museum (used with permission). Richmond Park was an armed camp during WW1 with several London Territorial regiments being trained there, including the 2nd Batt. Artists Rifles, 28th Battalion the London Regiment, who are seen here leaving Richmond Park for a route march, headed by their band. The Artists went to France in October 1914 as GHQ troops, and in 1915 was reorganised as an officers’ training corps. Later, other cadet battalions were reorganised on the same lines. During the war over 10,000 officers were trained in the corps and over 2,000 died on active service. 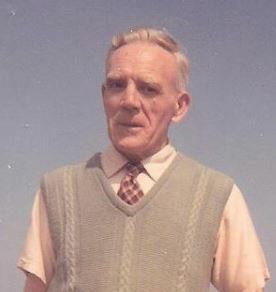 André Alolph Walser was the uncle of David Walser, a Barnes resident and FiSH volunteer. Andrew attended St Paul’s Boy’s School in Hammersmith and joined the Royal Flying Corps in 1914 at the age of 25. He was awarded the Military Cross and later became an Air Commodore. Amazingly, both André and David’s father, John Gustave Walser, were awarded the Military Cross – and this led their sister, who was then living in America, to name her new dog Military Cross! The rehabilitation of amputees has been an established service at Queen Mary’s Hospital, Roehampton for over ninety years. The history of Queen Mary’s began with the rehabilitation of service personnel who had lost limbs during World War I and amputee rehabilitation has continued to be a service at the hospital ever since. In 2006, the Douglas Bader Rehabilitation Centre – named after Douglas Bader, the RAF pilot who lost both his legs in World War II – was created within the new Queen Mary’s Hospital and provides a specialised multidisciplinary service to amputees from south west London and the region extending to the borders of Surrey and Sussex. FiSH member and volunteer, Rachida Ez-Zihi, grew up in Morocco and had her left leg amputated above the knee at the age of 7 due to a severe infection following a fall. To begin with Rachida managed on crutches for 3 years until being fitted with a ‘peg leg’, which she wore for 5 years. “My dream was to be able to wear a pair of shoes together!” she says. An English teacher working in the university in Casablanca, along with the Franciscan nuns at her school, paid for Rachida to come to London and get a prosthetic leg at the world famous Roehampton limb unit. To date Rachida, who now lives in Barnes, has had 12 different legs. “Every individual has a tailor made leg – with most costing £10,000 or more.” She is grateful to the limb centre for their pioneering work and assistance which allows her to be more independent. Whilst the men were fighting overseas, many women were engaged in munitions work during WW1 and the mother of FiSH member, Joan Salmon, was one of the many who worked in a munitions factory. The work was dangerous as, in addition to the risk of explosions, they worked with hazardous chemicals on a daily basis, usually without adequate protection. Over time, exposure to the chemicals posed a major risk to the women’s health as they frequently caused a whole range serious and unpleasant side effects.